The most reliable and efficient check valve available. The disc pivot point is off center. This precise constructed feature slows the closing of the disc. Split body design increases the flow area around the disc by 40% creating very low head loss. Seating is metal to metal. This valve is built to last! 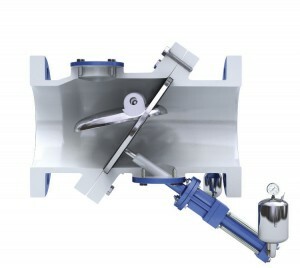 Available as a ‘free swinging’, ‘free open-controlled close’, or ‘controlled open and close check valve’. The body is available in Cast Iron, Ductile Iron, Cast Steel or Stainless Steel. Pivot Pins and Seats are Bronze or Stainless Steel. Highly recommended for maximum efficiency in Power Plants and Water Pumping Stations. Ratings 125#, 250#, 300#, 600# class.